Despite the hustle and bustle of Atlanta’s city streets, the metropolitan region is centered in the middle of a growing urban scene. With exquisite hiking trails, state-of-the-art markets, and trendy shopping districts, Atlanta is one of the most captivating places for modern travelers to visit along the northern hemisphere. With so much to see and do in Georgia’s state capital, families will find themselves indulging in a wide variety of local adventures. As a growing city, travel plays a significant role in how you plan your trip. Since navigating the public transit system can become overwhelming for any new visitor, it is crucial to understand the importance of private travel when transporting medium or large groups to and from the whirling city. With a personal driver at your fingertips, your family will be able to follow their own travel itinerary while sightseeing at camera-grabbing spots along the journey. Preparing for any trip requires careful planning, from putting together your bus schedule to deciding where to stay. Depending on which district you are staying in, Atlanta provides a myriad of selections from Airbnbs, hotels, and inns, all providing affordable comfort for families and friends. Atlanta offers a safe and comfortable stay in each district and neighborhood. Explore these lodging options available across many districts and neighborhoods in the area. 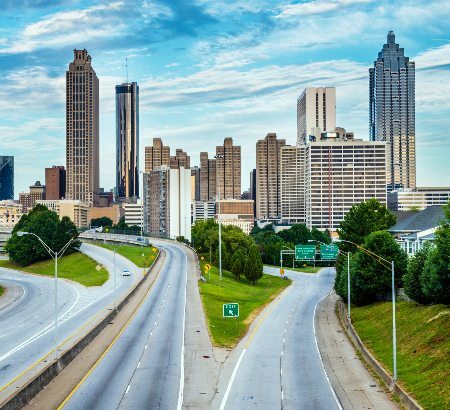 Once you’ve decided where you’ll be staying, determine where you’d like to begin your travels with this list of popular new attractions in Atlanta, Georgia. Wrap up your first-time trip itinerary with these main staples in The Big Peach. Depending on your group of family or friends, you may enjoy a walk through these parks, strolls through the markets, or a night out on the town. Explore your choice of local attractions with a personal driver for your family and friends! Spend the first day of your trip itinerary traveling to Atlanta’s older attractions before exploring the newest of the city’s additions. Experience how Atlanta has changed drastically in the last twenty years, as the 1996 Olympics presented a huge turning point in Atlanta history. Witness the first foundations of Atlanta as a new modern city through these timeless events that will fascinate generations to come. Built during the 1996 Olympics, Centennial Olympic Park has been the focal point for downtown events for well over a decade. As a popular tourist destination, the 21 acres are usually packed with families and friends circling the fountains, riding the Ferris wheel, or attending concerts and festivals within the park. The Georgia Aquarium plays an important role in Atlanta’s downtown scene. The aquarium contains about eight exhibits with more animals than any other aquarium on earth. The tanks contain about 10 million US gallons of salt and freshwater filled with marine life. When it was built, it was the biggest aquarium in the world, but now still remains the largest in the U.S.
Piedmont Park is a beautiful natural space where people go to play sports, walk their dogs and even to catch rare Pokemon. As an attractive destination for Atlanta’s in-town culture, the park is renowned for hosting different festivals and concerts. The natural space is perfect for family picnics, recreational sports teams, and group outings. View the Atlanta Skyline from the field! This urban market is a recent addition to Atlanta’s lively city scene. The market was once used by the historic Sears, Roebuck and Co. from 1926-1987 before being constructed into the “City Hall East” by the City of Atlanta. The property spans over 2.1 million square feet and the lot covers around 16 acres. The building was officially renovated as the namely Ponce City Market and opened on August 25, 2014. The market is home to a wide selection of local eateries such as Eats, Ton Ton, and El Super Pan. You can even stop by the famous you can even stop by the famous Old Fourth Ward Park after a day of shopping. This marketplace is a part of Atlanta's rich and long-standing history. Since opening as the Atlanta Stove Works in 1889, the market has offered Atlanta locals and visitors with goods for well over a century. Krog Street is also known for its enjoyable food district supplying visitors with unique and charming restaurants such as Pho Nam and the class of the indoor winery. Discover these most popular new attractions that have recently come to Atlanta. You will want to dedicate a whole day to these two sports arenas due to their unlimited events and eateries. It’s more than just markets that are burgeoning forth from the city. Many travelers overlook the new stadiums being built across all Atlanta sports teams from Turner Field being revamped into SunTrust Park, to Mercedes-Benz Stadium built for Atlanta United and the 2019 Super Bowl. The city is still building additions and investing in a brand new Hawks arena! SunTrust Park is far more than just a ball field. The park has now extended the beloved Turner Field baseball stadium into a large event space for shopping centers, concerts, and nights out on the town. Many of the city’s biggest concerts take place in its field as fans fill up the seats during summer months. The nearby Battery houses a variety of restaurants and bars, opening up a new spot every few weeks where guests can dine and shop. Spend your late evening watching an Atlanta United soccer game at Mercedes-Benz Stadium. The brand new stadium is a draw for international visitors and local sports fans. The arena was built by Arthur Blank, the founder of Home Depot and the owner of the Falcons, who also extended the stadium with newer additions such as the new multi-purpose greenspace and The Home Depot Backyard to be enjoyed as a playground, pavilion, or for tailgating. Make sure to research the best spots to park and set up in downtown Atlanta before arriving to the game. The easiest way to travel to and around Atlanta is by private bus rental. If you’re planning a trip to the bustling city of Atlanta as a first time visitor, plan with one of our travel professionals. Falcon Charter Bus is a top transportation provider in the Atlanta area, offering diverse and affordable services for families and groups making their way around Atlanta. If you’re planning a trip to Georgia and are considering a private rental, Falcon Charter Bus will help you find the best travel options for you! Travel consultants are available 24/7 at (404)-400-3545 to assist you in your travels in and around Atlanta. Give us a call today for a free, personalized quote! Whether traveling for a wedding, business conference, church outing, school field trip, or a group vacation, Falcon Charter Bus will provide safe and accommodating transportation services.